Since 1984 the Bryn Mawr College Performing Arts Series has presented great artists and performances to audiences in the Philadelphia area, creating an environment in which the value of the arts is recognized and celebrated. Talks and workshops provided free to the public help develop arts awareness and literacy. The Series works to lower barriers to arts access through its partnership with Art-Reach, a nonprofit dedicated to improving arts accessibility for people of all ages and circumstances, and through its low ticket prices. Partnering in recent seasons with such organizations as the Baryshnikov Arts Center, the Bryn Mawr Film Institute and the Philadelphia Live Arts Festival, the Bryn Mawr College Performing Arts Series has presented performances and enriching events by such luminaries and visionaries as Meredith Monk, John Waters, Il Fondamento, the Khmer Arts Ensemble of Cambodia and Urban Bush Women. The Bryn Mawr College Performing Arts Series gratefully acknowledges support from The Miriam Schultz Grunfeld ‘69 Fund, established by Carl Grunfeld, M.D., friends, and family members in memory of Miriam Schultz Grunfeld ‘69. Since 1996, the Grunfeld Fund has enriched student life by supporting art history, the arts and literature. The Bryn Mawr College Performing Arts Series gratefully acknowledges support for its 2013-14 season from the Pennsylvania Council on the Arts. 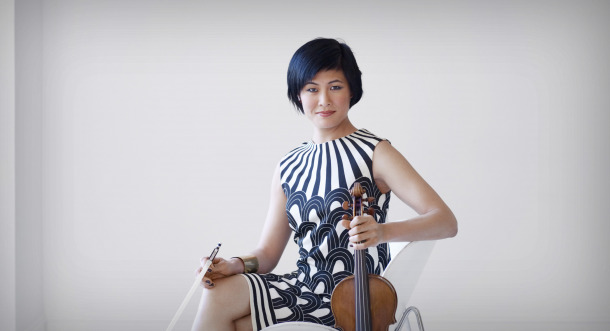 BRYN MAWR, PA – The Bryn Mawr College Performing Arts Series closes its 2013-2014 season in March with Bach and Beyond by Jennifer Koh. Hailed for her intense, commanding and “deeply expressive” (The New York Times) performances, Koh offers the final part in her challenging and inventive set of three solo violin recitals that explores the connections that tie the solo violin repertoire from Six Sonatas and Partitas by Bach to modern day composers, including newly commissioned works.